When you book a winter sports break, the thought of a holiday in the snow, the snowboarding, skiing and snowmobiling can overtake the sheer practicalities...like the fact that most winter sports demand a certain level of physical fitness! The sheer physical demand you put on your body to deal with the cold, the altitude and the – exertion can lead a less healthy person to wish they’d booked a holiday somewhere less active. What Should You Do Before You Go? If you’re a gym member, the best thing to do is ask your gym instructor to provide you with a fitness programme incorporating exercises that will get you winter sports ready, in the weeks before your holiday. This can help you reduce the amount of muscle soreness you’ll get from your holiday activities, as well as helping you to reduce your chances of injury. Do You Have to be Really Fit? There’s no denying that your fitness levels will need to be high whatever winter sport you decide to embark upon while on holiday. The preparation in terms of exercises that you do before you go are pretty similar whether you are snowboarding or skiing in any variation. Try to get in some cardiovascular work as well as some specific resistance training - even if you are reasonably fit and healthy, it’s a very good idea to do some specific conditioning exercises to get your body ready for the holiday. What Sort of Exercise Should I do? Running, swimming and cycling are all good forms of cardiovascular exercise that are good for general conditioning pre holiday. 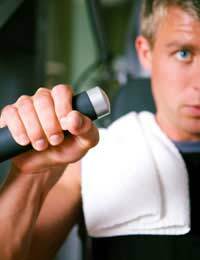 If you’re a gym member, use the rowing machine and the cross-trainer too, for at least twenty minutes per session. Use free weights and gym weights machines to help with resistance training and strengthen specific muscle groups. You need to cover all the major muscle groups as they are all used in snowboarding and skiing. If you’re not a gym member, you can try some fitness moves at home - Single-leg balancing or single-leg squats will help to strengthen leg muscles and your knee joints.For the upper body, push ups are simple and effective, as are tricep dips using a chair or stool. Physical fitness consists of more than cardio work and strength training, and it’s important to make sure that your core muscles and balance get a thorough work out if you intend to set foot on a ski or snowboard on holiday! It’s been reported that a majority of the injuries sustained while skiing are a result of poor balance and core stability – so don’t neglect these areas when you’re planning your pre-holiday fitness programme. Ask your gym instructor for specific moves that will help your balance and stability – or if you know anyone with a games console like the wii fit, you could use that to help you improve balance. Snowboarding also needs complete body control if you’re going to manage to stay upright on the board, and you put a huge amount of stress on your core muscles and abdominal's as you use every muscle group in order to remain balanced. Toning up these muscles before you go will help you stay upright – and also help stave off the muscle soreness you’ll feel if you haven’t put in the exercise before you go!